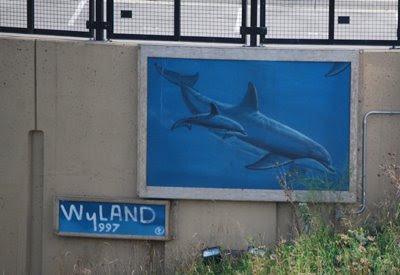 Artist Wyland painted one of his whale murals on the side of the Courthouse Annex in 1997. In 2004, the Annex was razed in conjunction with the Marquette Interchange reconstruction. This led to the artist claiming that the mural was protected by federal law. Milwaukee County subsequently produced documents showing that the protections were invalid. A small part of the mural was preserved, and is now mounted on the wall next to I-43 just south of State Street. That was so cool. My son is 11 now, he watched it being painted, loved the wall and was so sad it was taken down. Of coarse the goverment produced paperwork to get their way. Perhaps the new wall needs a mural depicting bureaucracy at work! The documents were a contract that Wyland signed specifically relinquishing his rights to the mural. My father worked for one of the contractors that designed the Annex. When the facade began to fall off (onto the freeway), he said it was not surprising, as the construction materials and methods available at the time were not expected to last as long as they had. The building was deteriorating, and needed to be torn down. Frankly, the back of the County courthouse is a much better view than the Annex ever was.